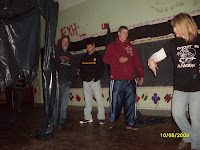 To the right is Nick, Travis, Nick and me in the old building of the Fairview School. We are in what they think is the art room. 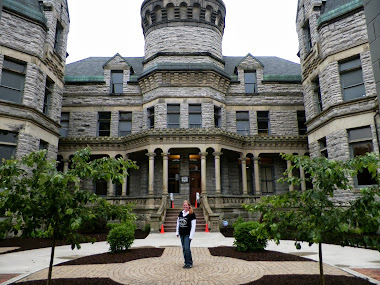 We did not get much in the way of audio like EVP, but physical activity on this whole floor is high. 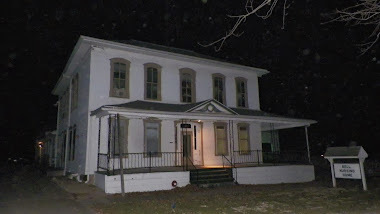 There were loud taps that we picked up on EVP and heard with our own ears. 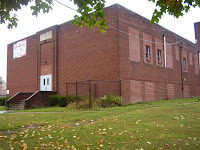 Fairview School has been closed since 2003. Enrollment was way down, and from what I understand there were only between 40 and 70 children attending class there. The halls are quiet now. 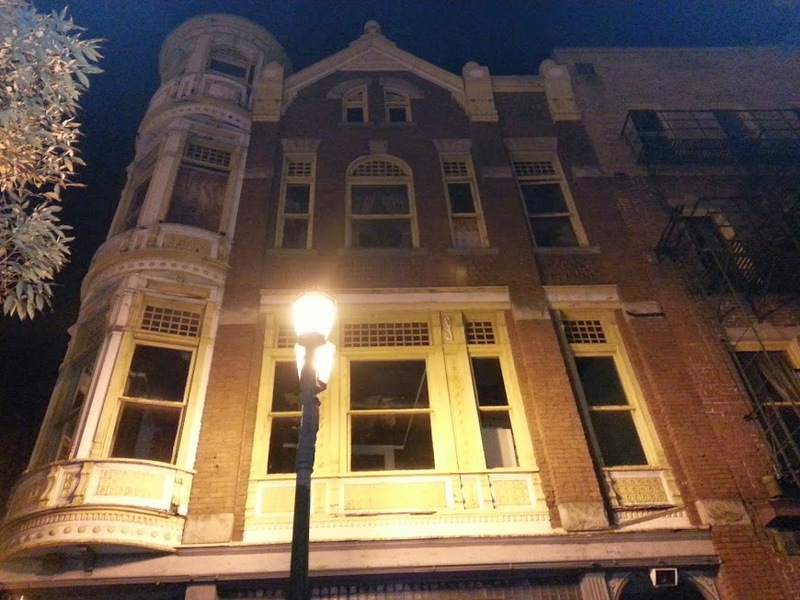 It had a short run as a restaurant, but Dalonzos move to downtown Wellsville. Ghosting 12 has been there twice now. 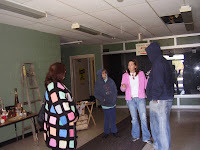 This pic is of Amy talking to Nick and Mindy about the ghosts she feels in the two buildings. The main story is of the late principle, Charles Wilfing, who died in 1979, while a principle of the school. He is said to haunt the buildings now, still in charge of the abandoned hallways. His picture hangs in the newer building. While there were still students attending his picture kept falling from the wall for no reason. Another problem they had was with the PA system. It would turn on all by itself. 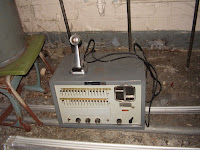 The PA system was found in a restroom in the older building. This room has been called the punishment room. It is located in the older of the two buildings (built in 1938). 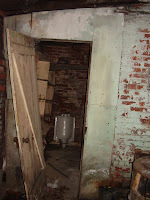 It is said that children were locked in this room as punishment when they misbehaved. Amy has a hard time even coming in here, the feelings are so negative. We plan on setting up a video camera in here and having everyone do 15 minutes alone in in the dark in this room on Friday night. If any one will do it that is. This is the first graduating class from the older building taken around 1942. The front steps are the same, but the doors have changed. 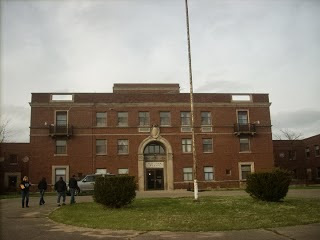 This is the older building. As Mindy and I walked the top floor hallway, we stopped to look at a part of the ceiling that had fallen. A plastic bottle that was hanging from the ceiling with binders twine suddenly fell to the floor beside us. It rattled our nerves pretty good. Nick Dalonzo, Mindy, Nick Jr. and several others will be attending the investigation on Friday, which is going on all night. 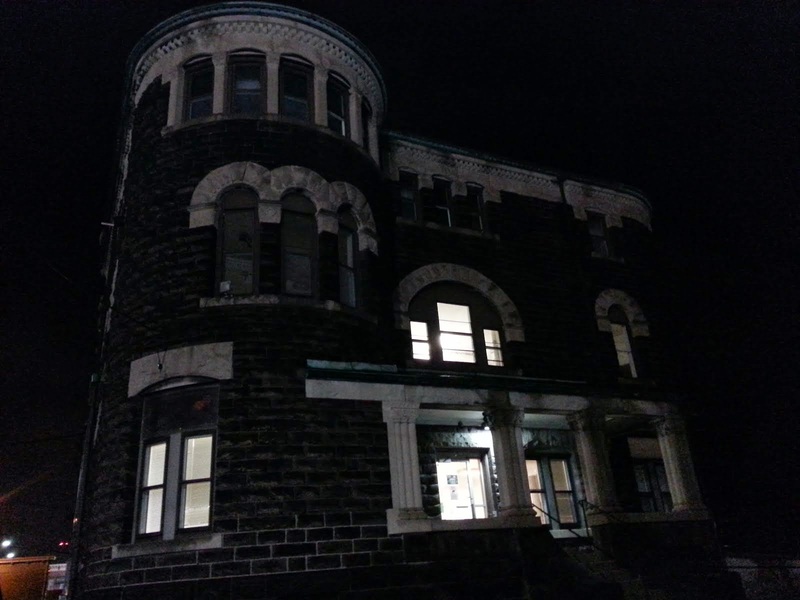 It is going to be a great Halloween investigation. Wish us luck. You're right. You won't find your comment on my blog. Threaten what ever you want. You don't scare me.